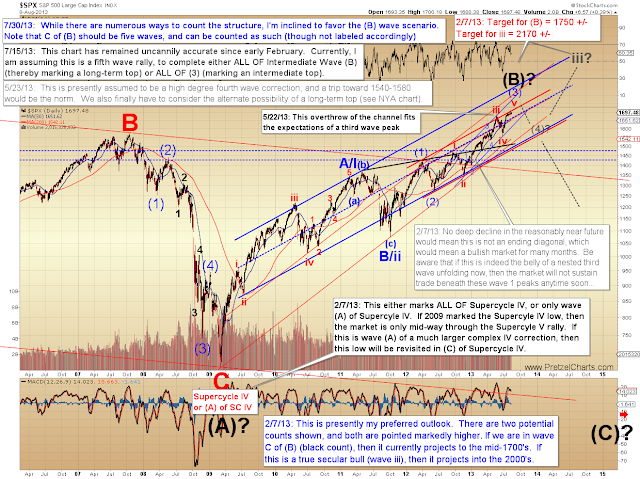 The market has been range-bound for the past few weeks, but should be close to declaring its intentions. We've reached an important inflection point, and as most readers know, I expect that we're very close to beginning a significant decline. While I'm not closed to more bullish options, I'm inclined to stick with February's projection for an important top forming in the 1700+ price zone, and the market has shown me nothing to make me any more bullish that that -- quite the contrary. So the main question in my mind is how close we'll come to February's target of 1750 +/- before the anticipated decline begins. As we'll discuss shortly, the possibility exists that decline may in fact have already begun. After we run through a few price charts, I'd like to share an incredibly interesting Rydex fund chart which should give bulls cause for concern. Starting off with a chart that shows why it's a bit too early to call the next move with conviction, we can see on the NYSE Composite (NYA) that the market has been noisy and range-bound for some time. This could be a reversal pattern, or merely a consolidation before the rally continues toward the long-term price target from seven months ago. We simply won't know until the market makes a sustained break. The long-term chart shows that we're presently in the CE ("close enough") zone, but with the market range-bound in the recent past, it's just a bit too early to call whether we've seen all of red wave v yet. On the S&P 500 (SPX) hourly chart, we're presented with a fairly clean sell trigger at 1684, and this roughly matches the technical theme of the NYA chart shown previously. 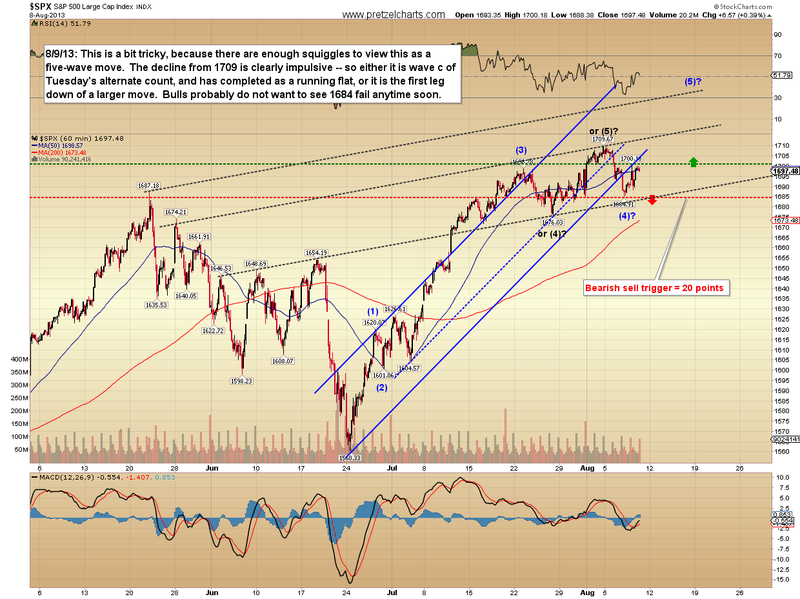 We can also see that SPX has formed enough waves that we could conceivably view this as a complete five-wave rally. 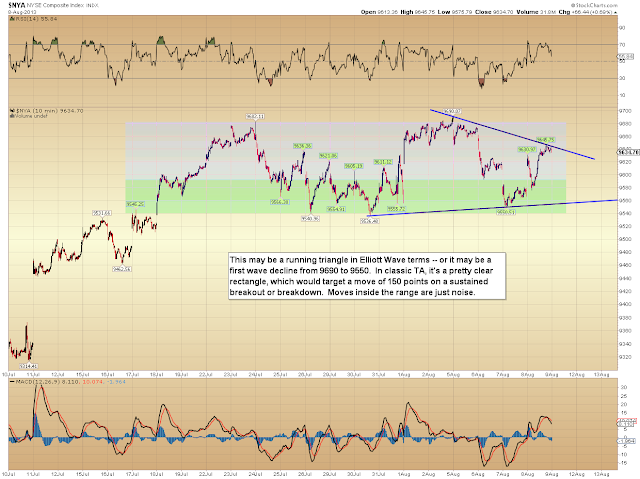 So far, the breakout over the May high hasn't been significant enough to signal any kind of all-clear for bulls. 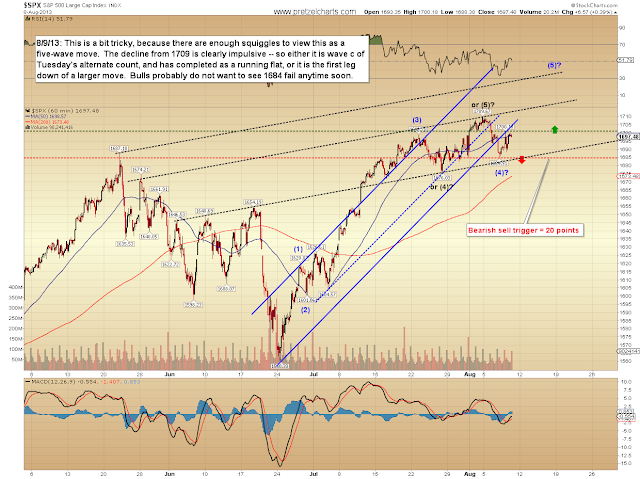 Meanwhile, the decline to 1684 and subsequent bounce could simply be viewed as a back-test of the May high. In other words, there's not much info being conveyed by the charts here, and the market needs to declare its intentions with a breakdown or breakout before we can feel more confident in the next sustainable directional move. Finally, I found the chart below of significance. This chart is from Sentimentrader, and it supports my preferred wave count. 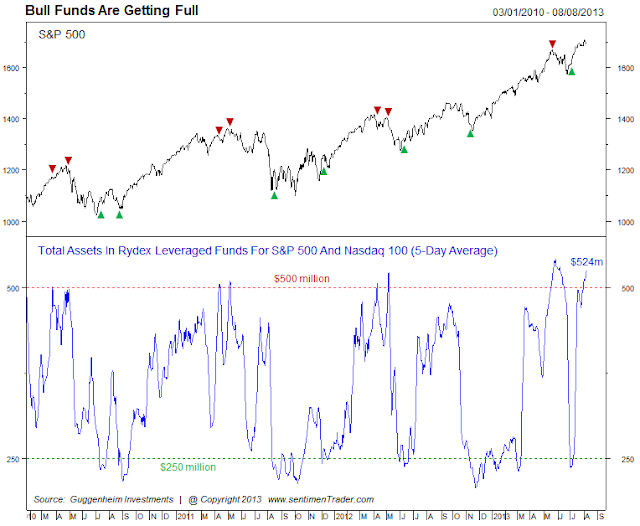 It seems the bull bandwagon is reaching maximum capacity again, and we can see on the chart that Rydex funds reaching this extreme level has, in the past, been a very reliable signal of an impending top. This chart very much backs up the expectations of this rally being the fifth and final wave of the current price structure. 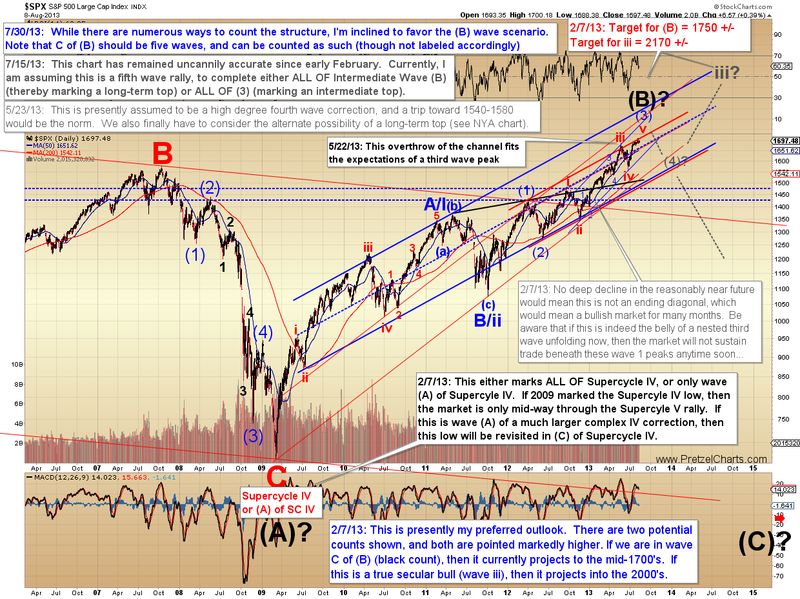 In conclusion, the expectation remains that the market is nearing, or has reached, an important top. The near-term isn't clear enough to declare a winner just yet, but we should be very close to receiving our next clue. Trade safe.